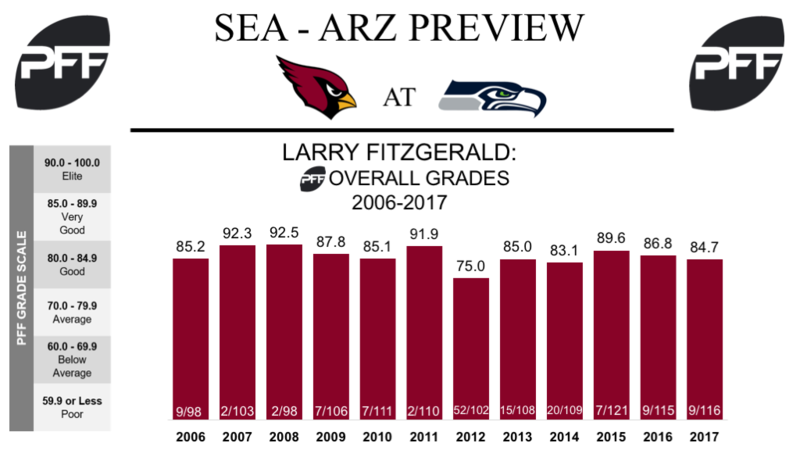 WR Larry Fitzgerald vs. CB Justin Coleman – The ageless Fitzgerald has been spectacular this year and through 15 games, it’s hard to imagine how the offense would have functioned without him. However, the veteran receiver is uncertain on whether or not he will return next season, so this could possibly be the last time we see Fitzgerald grace a football field. This season, at age 34, Fitzgerald has run a total of 616 routes, which is more than any other receiver in the league, and he’s amassed 1101 receiving yards (eighth most) at an average of 1.79 yards per route run, the 21st best mark among 90 qualifying receivers. He’s also been quarterback Drew Stanton’s go-to playmaker. In Stanton’s four games as starter, Fitzgerald has been targeted once every three pass attempts and has accounted for a staggering 44.2 percent of Stanton’s passing yardage. In what could be the last game of a truly stellar career, Fitzgerald will be looking to get the better of cornerback Justin Coleman, who has allowed an average of 0.99 yards per coverage snap and a passer rating of just 71.2 this season, which ranks 33rd and 28th among 85 qualifying corners, respectively. T Will Holden vs. Edge Frank Clark – With D.J. Humphries and Jared Veldheer both on injured reserve, the Cardinals have turned to fifth-round rookie Will Holden to man the left tackle position. He got off to a rough start in Week 15 against Washington, where he allowed one sack and three hits on 48 pass-blocking snaps, but he showed great improvement in Week 16 against the Giants, where he allowed just one hurry on 37 pass-blocking snaps. He’ll be aiming to finish his rookie season on a high note, but he’ll have his work cut out for him against Frank Clark, who has racked up 37 total pressures from the right side of the defensive line this year, the eighth-most among 4-3 defensive ends. RB Elijhaa Penny vs. DI Sheldon Richardson – With just one game of the regular season to go, Penny will want to show the Cardinals’ coaching staff that he’s worth a spot on the roster for next year. Over the last two games, Penny has seen 18 of the Cardinals 52 carries and has averaged 2.94 yards after contact per attempt, the 11th-best mark among backs in that span. As he looks to impress in his final game, he’ll need to steer clear of Sheldon Richardson, who will also be aiming to impress. Through 15 games, both Richardson’s overall grade of 84.0 and his run-stop percentage of 9.4 percent rank 24th among qualifying interior defensive linemen. 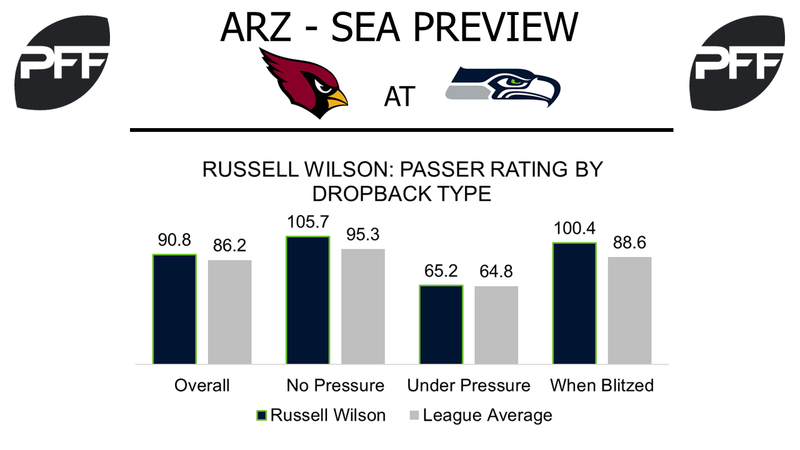 QB Russell Wilson vs. Arizona Blitz – The last time these two teams played, the Cardinals blitzed 12 times on 40 passing plays. Wilson was sacked three times, but when they didn’t get to him he completed eight passes for 35 yards, two touchdowns, and accrued a passer rating of 122.5. The Cardinals are currently tied for fifth in blitz percentage, as they blitz on 37 percent of passing plays. Meanwhile, Wilson has been very efficient when defenses send extra pressure at him. Wilson has completed 82 passes on 131 attempts while being blitzed for 1,131 yards, 13 touchdowns, five interceptions, and a passer rating of 100.4, well above the 88.6 league average. WR Doug Baldwin vs. CB Patrick Peterson – Since Week 10, Peterson has seen 10 targets into his coverage away from his usual left cornerback spot. He has allowed six of those targets to be caught (one drop) for 57 yards and allowed two touchdowns while intercepting one of those attempts. With the Cardinals’ season all but over, expect Peterson to shadow Baldwin, who caught one pass on one target for 14 yards back in their Week 10 matchup. Since that meeting, Baldwin has been targeted 30 times, catching 17 passes for 268 yards, and three touchdowns, all the while generating a wide receiver rating of 92.1, 52nd among 83 receivers with at least 16 targets. In that same span Peterson has allowed 13 catches on 23 targets for 163 yards (70 yards after the catch) and a passer rating of 89.6, 48th among 78 cornerbacks with at least 130 coverage snaps. T Duane Brown vs. Edge Chandler Jones – Since joining the Seahawks, left tackle Duane Brown owns the league’s 12th-highest pass-blocking efficiency (96.4) among tackles. Until Week 16 he had yet to allow more than two quarterback pressures in a single game this season, but he was beat for four against Dallas. This week he will face edge defender Chandler Jones, who has the 14th-highest pass-rush grade (87.3) among edge defenders. He has also produced 29 of his 34 quarterback pressures from the right side since Week 9, third-most among all edge defenders in that time. Jones was credited with four quarterback pressures in their Week 10 matchup against the Seahawks, though Wilson was given responsibility for three of them.